Discover the Walk of Art! 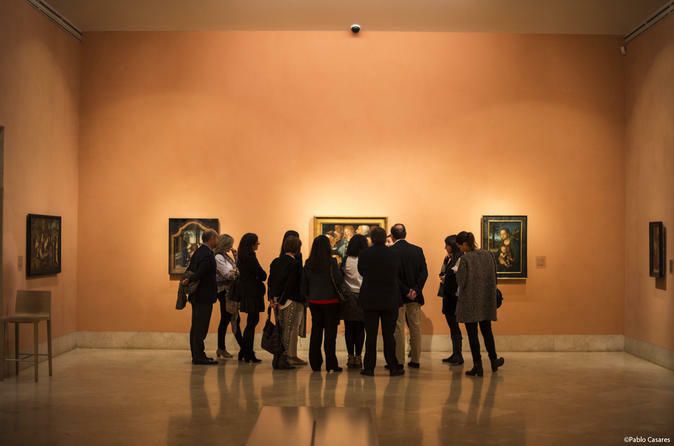 At Paseo del Prado Street you will find the best Art Museums in Madrid: Prado Museum, Thyssen-Bornemisza Museum and Centro Nacional Reina Sofía Museum.You will enjoy the best of the permanent collection in each one of them with this 5-hour guided tour. Our visit will start at Prado Museum, admiring the main paintings of Rafael Sanzio, Fra Angélico, El Bosco, Tiziano, Velázquez, Rubens and Goya. After visiting Prado Museum, we will stop to have a drink with a tapa, before going to Thyssen Museum. We will continue our visit in Thyssen-Bornemisza Museum, where we will enjoy the main impressionist painters, such as Degas, Cezanne, Renoir, Van Gogh, Gauguin, Pisarro, Derain, etc. We will finish our visit to the Thyssen Museum with the collection of Pop Art and Dadaism, with works of Roy Lichtenstein, Richard Lindner or Richard Estes. Our next stop is Reina Sofía Museum. We will enjoy admiring the great Guernica of the unforgettable Spanish painter Pablo Picasso and the main works of the brilliant Salvador Dalí. Our tour ends here, but you will be able to return to each of the museums, since the tickets are valid all day long during the opening time.